What if unemployed Detroiters could transform vacant property into a beautiful, working landscape, one that sustained residents for generations to come? And, what if, in the process, they could also access landscape industry training, job-readiness programs, and case management services? That was the concept behind the Detroit Conservation Corps (DCC)—a concept envisioned by The Greening of Detroit in partnership with Focus: HOPE, Neighborhood Service Organization, and the McGregor Fund. DCC began to take shape in the spring of 2014 with a $50,000 planning grant from the Fund. 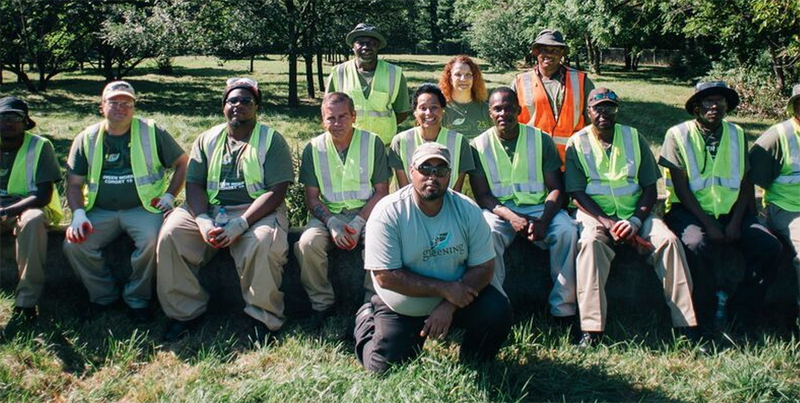 Since June of 2015, a two-year, $500,000 grant from the Fund has supported capacity building to scale The Greening of Detroit’s proven training program and contract services work into larger operations with its new partners. Ultimately, the program will train up to 2,000 unemployed Detroiters through an eight-week landscape industry program (DCC Training) and provide entry-level jobs through a local conservation corps (DCC Enterprise).